Spyborgs is not: Game Party 82; Bad port, "now with waggle"; Sports Minigames 15; Saturday morning license – Sign displayed prominently inside Spyborgs' presentation room. There are lots of things Spyborgs isn't, or at least isn't anymore. Back in January, Bionic Games announced that they had scrapped the original premise of the Wii brawler and started over. Good thing too, this new iteration seems to have more in common with Ratchet and Clank than a Saturday morning cartoon. "This is a much different game than last year," said Daryl Allison, Spyborgs producer. " We went with the focus of what worked and to try and keep the flow of the original title." Kraig Kujama, director of design for Capcom U.S. product development, said that the Wii market needs a great action game and that Spyborgs, which they described as Ratchet and Clank meets Devil May Cry, will be it. The coop third-person action game has players take control of a cybernatically-enhanced group of super heroes. The game will include 35 stages and three Spyborg characters to choose from. During our demonstration we were only shown two of the, an oversized, gorilla-like robot and a katana-wielding woman. Much of the play is conducted by moving around the screen with the nunchuk's thumbstick and pressing buttons to attack, though certain special attacks do require timed waggles or movement of both the remote and nunchuk. 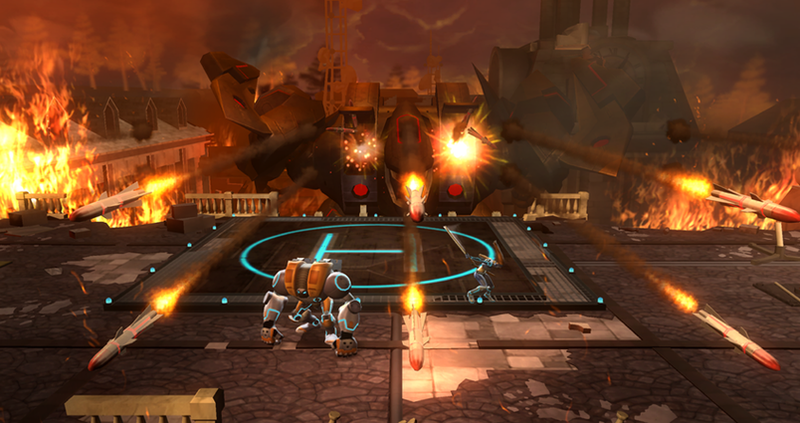 There are cooperative attacks as well which require both players to land motion controls at the same time. The game also features a feature called spy vision which allows you to search the screen by pointing the remote at it, when you pass over a hidden object the control shakes and you can see it silhouetted in the beam of the remote's spy vision. By holding a button and yanking you can pull the item into the visible world to interact with. The developers, made up former Insomniac Games and High Impact Games developers, are also looking at the possibility of adding Wii Motion Plus support to the game, they said. Spyborgs will also include an achievement system, which rewards achievement titles for certain accomplishments. These achievements also unlock bonus videos, concept art and new challenges in the game.